Note from Real Crimes: Rose Stump wrote and signed this report. We have no legal right to alter it without her signed permission. However, Rose is now deceased. Bernie Becker's older daughter has contacted us to request that her name be removed from this report. Since she and her sister were minors when Tom Stump disappeared, and since, in her book, TWO GONE MISSING, Rose voluntarily changed their names so as not to cause them embarrassment, we feel that she would have wanted to honor this requst. Therefore, in this report, we now have changed the names of Bernie's daughters to the names that Rose Stump substituted in her book. The real names of those two individuals are part of public records. 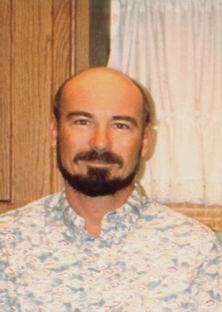 My oldest son, Tom Stump, 41 disappeared from his home on Summerland Key, Florida, on July 24, 1995. In 2002, when I originally posted Tom's story on this web site, I had no preconceived idea about what happened to my son. I just knew that the circumstances of Tom's disappearance were suspicious and there were many questions that needed answers. Since then, however, I've received information that Tom may have become a threat to a major drug operation that links the Florida Keys with New Orleans. That may or may not be true, but it has opened my mind to new possibilities, especially since learning about another drug-related missing person's case -- Diana Harris -- that involves several of the same people who are linked to Tom's case. (See update at the end of this report.) I'm receptive to receiving further information by private e-mail sent c/o the Real Crimes web site. I talked with Tom by phone the day before he vanished. He had just rented a van to take his wife, Bernie, and two daughters, Callie *, 12, and Molly *, 8, on a vacation trip. He said he would call me as soon as they got back from their trip. That evening, Tom and Bernie took the girls and two of their friends out to dinner to celebrate Molly's eighth birthday. The next morning, Tom got up at dawn to put gas in his pickup truck without Bernie's knowledge. Later he went to the bank and to the post office to stop the mail. At 7:30 p.m., Bernie contacted the Hertz car rental office and told them she needed a new set of keys, because her husband had lost the first set while swimming in a canal. She was told to call back the next day. In her second call, she said the keys were lost when her husband went out in a boat and committed suicide. At 7:53 p.m., she told another individual at the rental agency that she thought her husband had drowned himself in the ocean. My youngest son, Chad, and I immediately flew to Florida. Tom had discussed his marital problems with Chad and, as confirmed later by Tom's business partner, Scott Haskell, Tom suspected Bernie of seeing Bill Becker, a prominent radio personality, man-about-town, and a friend to many in law enforcement - someone with a lot of "clout." According to a newspaper article, "Bill makes or breaks the politicians in the Keys." 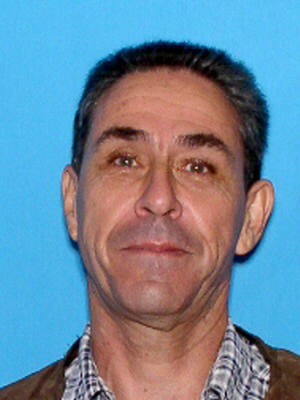 A search had been organized, and 26 of Tom's friends and neighbors were combing the woods. One of Bernie's ex-husbands, an ex-con by the name of Mark Ripin, whom Bernie still considered her "very dear friend," was also involved in the search. When interviewed by police, the children gave different stories. Bonnie continued to maintain that her father "walked into the woods," but Molly said he "drove off in a car," although neither of their cars was missing. The dog that detectives used to track Tom's scene did not go into the woods. Instead, it went directly to the road. Bernie stated that, during the early morning hours, Molly walked into their bedroom and found Tom cleaning his guns. Tom was a gun collector and owned six guns; according to Bernie, one of those guns, a Glock, was missing. (According to Scott Haskell, Bernie also owned a .380 caliber pistol.) Bernie told a detective that Tom had told her that he had hidden one or more guns in the woods, but hadn't told her where they were. That detective told me privately that something didn't seem right, and I agreed. Bernie would not allow me to talk to the children and was not happy when I was interviewed by Detective Penley. After taping interviews with Bernie, the girls, and me, Penley stated in her report, "The complainant followed me out to the car and seemed extremely nervous about my conversation with the victim's mother." Detective Penley also stated, "Complainant's demeanor was very upbeat and she spoke of getting on with her life." A few days after Tom disappeared, his business partner and an employee went to Tom's house to get tools from the company truck. As they were leaving, they noticed that the recycle bin contained champagne bottles and the trash bin held black gift wrap paper and black bows. "Somebody was celebrating something," Tom's partner observed. 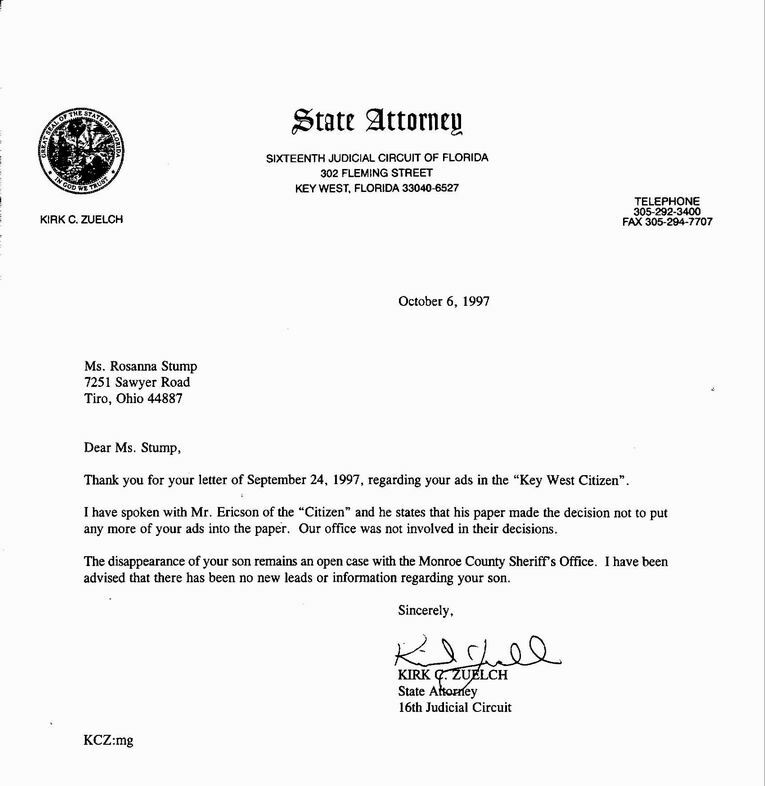 This information appears in Detective Penley's 8/14/95 report. 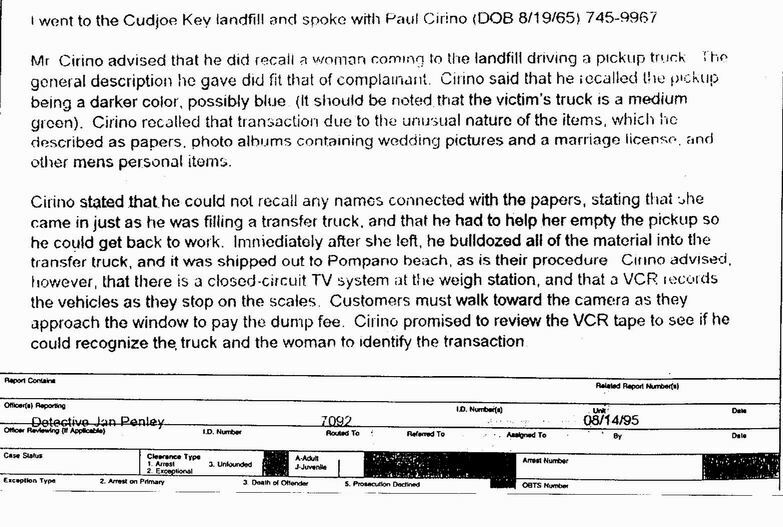 A man who worked at the Cudjo Key landfill contacted police to report a strange occurrence in which a woman arrived at the landfill with a pickup truck that matched the description of Tom's pickup. The man said he helped the woman empty the truck and was struck by the unusual nature of the items she was getting rid of - a marriage license, photo albums containing wedding pictures, and personal items that obviously belonged to a man. The woman didn't give her name, paid with cash so there was no receipt, and all the items were bulldozed into the transfer truck. 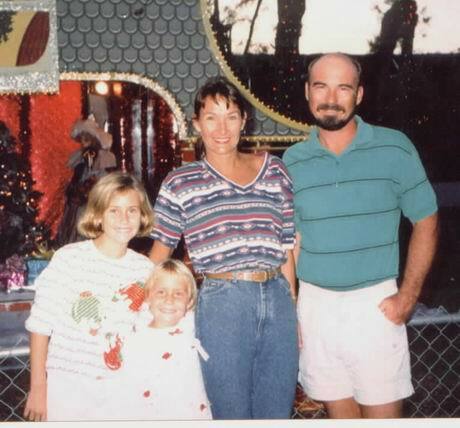 Six days after Tom's disappearance, Bernie left on vacation with the children. She returned home by herself, and the girls went to Chicago to visit their other grandparents. Bill Becker, then, began sleeping over at her house. My husband and I hired a private investigator. He is the one who found out about Tom's preparations for a trip with his family on the day he became missing -- that he filled his pickup with gas, went to the bank, and stopped the mail. 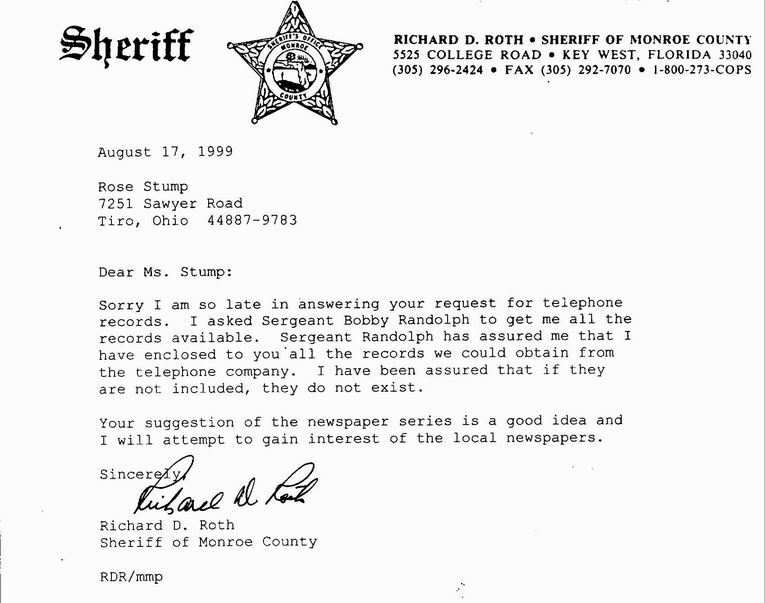 The sheriff's department supplied me with copies of their interviews with no problem, but when I requested the May-August calls to and from Tom and Bernie's home, which Detective Penley had subpoenaed, there was no information about any calls beyond the beginning of July. When I questioned the sheriff about this, he stated in a letter, "I have been assured that if they are not included they do not exist." That makes no sense at all, in light of all the calls that I know were made to and from that house in the days surrounding Tom's disappearance. Many of those calls were to me at my home in Ohio. In March, 1997, I placed an ad in two newspapers that service the Florida Keys, Citizen and The Key Noter. 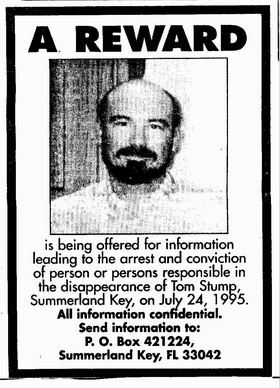 The ad read: "A reward is being offered for information leading to the arrest and conviction of person or persons responsible in the disappearance of Tom Stump on July 24, 1995. All information confidential. Send information to (a Post Office Box)." I included Tom's picture. In May, 1997, I called the Citizen and asked them to run the ad a second time. I was told by Randy Erickson, who was in charge of advertising, that the State Attorney had forbidden him to run the ad again. When I contacted State Attorney, Kirk Zuelch, he said his office had nothing to do with the decision and that Mr. Erickson had informed him that the paper had made the decision not to run the ad. I also received a letter from Bernie's attorney saying that I should not run ads seeking information about Tom's disappearance. 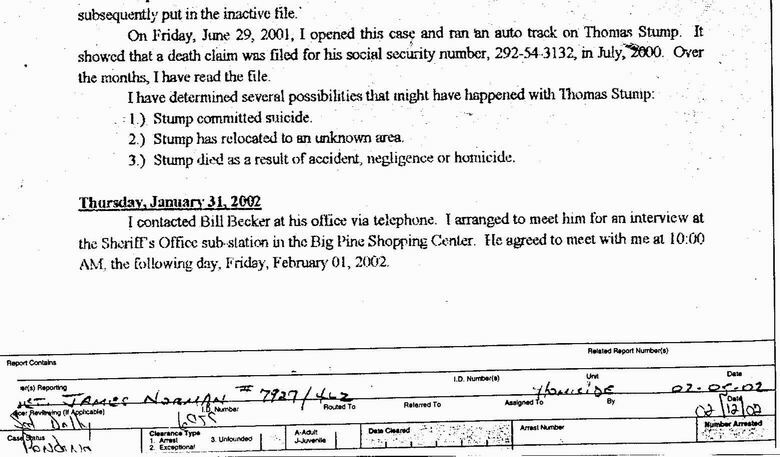 In 2000, Tom was declared legally dead, and Bill Becker and Bernie were married. 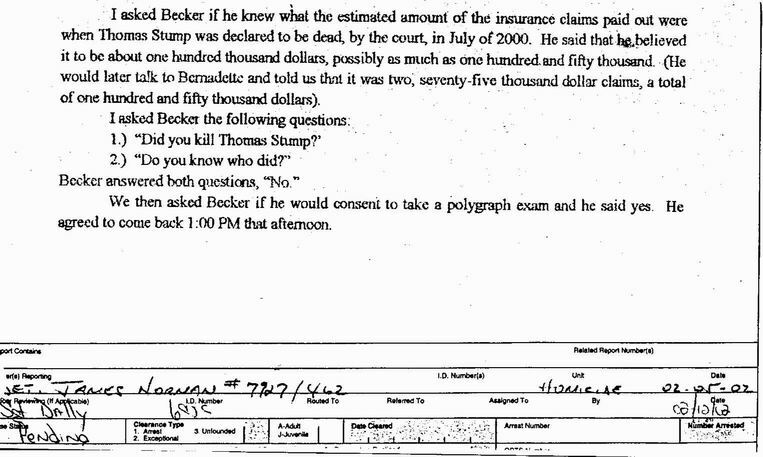 In February, 2002, Detective J. Norman gave Bernie and Bill lie detector tests. Reportedly they passed. Detective Norman's official conclusion was, "Stump committed suicide; Stump has relocated to an unknown area; or Stump died as a result of accident, negligence or homicide." What kind of conclusion is that? Who benefited from Tom's death? His wife received $150,000 in insurance money, plus the house, savings, etc. His partner, Scott Haskell, received the stocks and bonds that were in his and Tom's name and also several acres of land. It's impossible for me to believe that Tom committed suicide and hid his own body. It is equally hard to believe that he deserted his family. He was not that kind of person. Tom was co-owner of a successful construction business and was proud of all that he and his partner had accomplished. He was a very hard worker, but above all, a dedicated father. He went in to work early each morning so that he could be there when his daughters came home from school. He was devoted to those little girls -- helped them with their homework, prepared their dinners, and made sure that they did their chores. Even if his marriage to Bernie was rocky, he still had those children to live for. To walk out on his family or, worse, commit suicide on his youngest daughter's birthday - there's no way in the world that he would have done that. My daughter-in-law and I had always gotten along. Since Tom's disappearance, neither Bernie nor my granddaughters will speak to me. Not only have I lost a son, I have lost an entire a family. 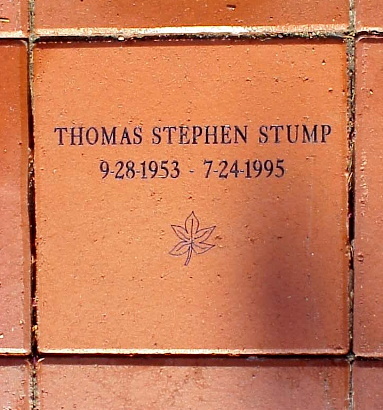 But, whether Bernie and her new husband like it or not, I am and always will be Tom Stump's mother, and I will continue to search and dig until I find out what happened to my son. P.S. In a town near us they are putting down bricks around the downtown with family names on them. We had one with Tom's name. I guess this will be the closest to a tomb stone we can give him. This memory stone to honor Tom's life on earth has the symbol of a buckeye leaf to signify Tom's closeness to his Ohio Roots. May Tom rest in peace.